“I had not been in jail before,” recalled Jody, who confided that when she started intentionally praying for divine guidance about how to use her life in God’s service, ministering to inmates was far from her mind. Then in her 30s, Jody, who asked to be identified only by her first name, was already teaching Sunday school at First UMC, Titusville, and she would go on to be a Florida Conference lay leader and General Conference delegate. But she lists her involvement in the North Brevard United Methodist Churches’ Ministry of Listening – a group later nicknamed “The Golden Girls” – as especially rewarding. She and other women from local churches have visited hundreds of women inmates in the county detention center every Thursday as part of a mission that began 47 years ago. 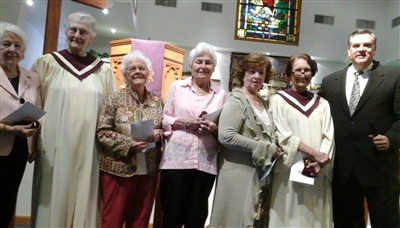 Known as "The Golden Girls," volunteers in the Brevard County Ministry of Listening are recognized for their service during worship March 9 at First UMC, Titusville. Left to right: Caroline, Ann, Jody, Jo, Judith and Joan, with Rev. Fred Ball. All attend First UMC, Titusville, except for Jo, of Indian River City UMC. Identified by first names only by request. Photo from First UMC, Titusville. Over the years, ministry volunteers, who once numbered three dozen or more, have shared Bibles and crafts with inmates and collected toiletries and underwear for those who didn’t have money to purchase them from the jail. But the most important gifts the volunteers shared were compassion and love. Only a few years shy of its golden anniversary, though, the ministry of The Golden Girls is in danger of folding. The volunteers, now down to a handful, have health problems or family obligations. Rev. Fred Ball, pastor of First UMC, Titusville, recognized the service and retirement of the women during Sunday worship on March 9, but he’s reluctant to turn loose of the ministry. Most prison ministries target men, he noted. Ministries to women inmates are less prevalent, and the Ministry of Listening has worked hard to cultivate a cooperative working relationship with the county sheriff’s office that manages the detention center. Volunteers who enter the prison must be female, Ball said. He has appealed to nearby United Methodist churches, including those shepherded by pastors in a new covenant group set up by the Atlantic Central District. “We’re trying to network five churches to work together by pooling resources,” said Ball, who estimated weekly Sunday attendance at his church at around 200. Joining with other churches could spread the volunteer responsibilities so that less falls on only a few shoulders. “We just know that God is tugging on some woman’s heart in the local church,” Ball said. The other churches Ball is working with are Mims, St. Andrew in Titusville, Indian River City and First UMC, Port St. John. Volunteers from other churches in the vicinity would be welcome, Ball said. Any of the retiring Ministry of Listening volunteers will be glad to share their expertise at conducting prison ministry, Jody said.